Situated on the hill on the left bank of the Arno river, Piazzale Michelangelo offers a magnificent view of the whole Florence. The square was designed by the Florentine architect Giuseppe Poggi and built in 1869. The wonderful Romanesque church of San Miniato al Monte dresses on the same hill. Flights of steps connect Piazzale Michelangelo to Piazza Poggi, where Porta San Niccolò (Saint Nicholas Gate) is to be found, and to the embankments. Our agency specialised in renting holidays apartments and villas in Florence and in the surrounding countryside has selected a series of apartments close to Piazzale Michelangelo (luxury apartments with panoramic terrace and budget apartments). 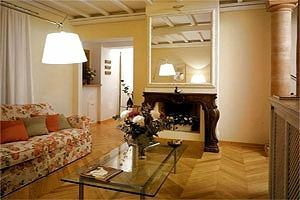 Visit our website: you will certainly find the ideal accommodation for your holidays in Florence. Rent one of our apartments close to Piazzale Michelangelo for your stay in Florence. 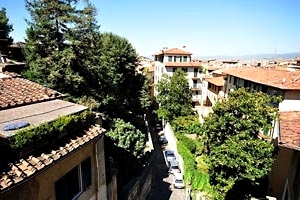 Apartment in villa for rent near Piazzale Michelangelo in Florence. Apartment with accommodation for 6 people, air conditioning, private garden, Sat TV, dishwasher, wash machine, clothes dryer, Internet connection.